Mary learned a great deal about magic from her new husband and Le Roy decided to increase her role in the act giving her the new stage name of Mercedes Talma that had a theatrical air about it. She immediately became familiar with conjuring techniques and quickly learnt manipulation and was quite amazing with her handling of playing cards and working with coins. It wasn’t long before she became an integral part of LeRoys show. She then began to incorporate coloured scarves and billiard ball magic into her coin work. In 1893 she met the American magician T. Nelson Downs who was a specialist coin performer and had become a headliner in theatres everywhere and was billed as “The King of Coins”. 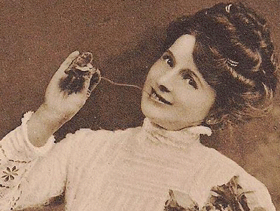 Talma had become so skilled in coin magic that she was appearing in her own show at the Oxford Music Hall where she was billed as the “Queen of Coins”. Critics at the time mentioned that she might well become a major rival to Downs. Interestingly Talma had very small hands and wore 51/2 size gloves. Yet she was able to conceal as many as 30 half-crown coins in one hand. The English half – crown is roughly the size of an American silver dollar. 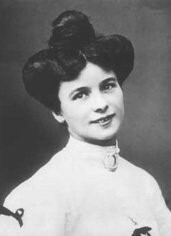 She had become a highly skilled pure sleight of hand performer and proved a major success in theatres in Britain, France and Germany. This was exceptional for a lady as someone who presented just a sleight of hand act. As a climax she would cause a rain of silver coins to pour from her tiny hands and was noted for her, “Out of the ear coin trick”. After a while she teamed up with LeRoy again to create a full evening show “Les Comedians de Mephisto Co”. This show would now involve three performers: LeRoy, Talma and a comedic performer named Leon Bosco. LeRoy presented the large illusions while Talma dressed in a full length black gown with a red rose in her hair would perform skillful sleight of hand magic with coins, while Bosco did comic presentations. Her lovely dresses were sleeveless that belied the fact that her audiences might say, “It’s up her sleeve”. Together they offered a good theatrical balanced variety show. It had all the elements of good entertainment for the time. They toured all over Europe, North and South America, Australia and South Africa very successfully. 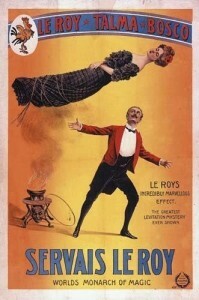 LeRoy had devised the Asrah Levitation and performed it in 1914 in London where his lady assistant Talma was levitated above the stage in this grand illusion. Floating above, the cloth was whipped away to show the lady had vanished completely. Even today many illusionists perform versions of Asrah. Leon Bosco as well as comedy was a master with playing cards and it is suggested that he invented the back palming of playing cards. His magic tricks often didn’t work out that was all part of his act but he liked to claim that he was the best card magician of the day. It was once recorded that Talma was accosted by a group of men set on robbing her. However when she began to produce coins at her fingertips, the would be robbers quickly disappeared in confusion. Servais Le Roy and Talma eventually retired to New Jersey in the USA but Servais was injured in an automobile accident. He attempted to present a final farewell performance before an audience of magicians but his show proved to be embarrassingly awkward. Feeling depressed and disillusioned he destroyed all his magic equipment and illusions and resolved to never perform again. Merceds Talma passed away on July 13th 1944 at the age of 83 and her husband in 1953 aged 88. Talma has left a challenge and lesson for all lady performers who by perseverance and dedication can achieve the same manipulation skills and prowess as gentleman conjurors. The lesson Mercedes Talma leaves us is that of the necessity of a background in theatre for all aspiring magicians who seek to perform on stage. It becomes a necessary part of the training needed to walk the boards. Perhaps at a later date we will look into the life of Servais LeRoy and his contributions to the field and history of magic.